Last month, I was living in like queen—traveling as forth north as the deserts and as far south as the magical, legend-filled islands. Last month, I was eating the sweetest strawberries I’ve ever had and the ripest vegetables I never liked until I had them the day after they were harvested. Now the farthest traveling I do is to my local Target to indulge myself with a Lunchable (the nacho one, obviously). It’s been weird coming back doing things like driving, grocery shopping, and eating McDonald’s—my stomach has not missed McChickens, that’s for sure. What I think has been really weird though is being able to understand everything that’s happening around me. I’m sure it will be weirder when I start Spring semester and all the material I’m learning in class I’ll be able to actually understand, but even now it’s strange. I can have a meal and participate 100% in conversation, I can go to the stores without panicking about vocab words, and when I watch the news, I know where each of the towns are. Even though this life with English is great, speaking Spanish every day is what I miss the most. There was so much adrenaline speaking Spanish to a stranger and praying they understood what you were saying. It made me feel so smart when they’d had a response other than como? [What?]. It made me feel even smarter when they’d respond with huge vocabulary words I didn’t know the meanings of because that meant they thought my Spanish was good enough to speak to me like I wasn’t a child. Granted, they’d end up having to re-explain things to me like I was a child, but it was great! Speaking Spanish every day there makes my life here seem way easier and more plausible. Things like figuring out lease issues or explaining what kind of headache pain I’m having is so easy. The best thing I’ve accomplished though, is being more okay with saying, “I don’t understand.” Before leaving for Chile, I was always a little embarrassed to ask someone to reword themselves, and I always thought I was the only one in the room who didn’t understand what someone was saying—despite all middle school teachers’ favorite saying, “Chances are, if you don’t understanding, neither does someone else.” Now, I have no problem asking people to go over something again. I did it so much in Spanish that it has become like second nature to ask questions. This transition from Spanish back to English though is kind of a weird one. Even though I encountered English at some point every day when I was abroad whether it was talking to friends from home or listening to music or watching Netflix, I am still finding it a little hard to make the full switch back. For example, the names of food are the hardest. After killing myself over knowing all the vocabulary words for food we ate every day, I seem to have misplaced those English words far back in the file drawers. I can never remember the word for spaghetti or avocado because my brain still thinks I’m eating fideos and palta. It also takes me just a smidge longer to explain things and write things. Even in my blog posts, I can tell my grammar and word order has worsened, maybe not noticeable to all, but definitely noticeable to me. And even though writing is something I can fix by going through it, I can’t fix it. I can’t figure out how to move a word or come up with a different one to make it flow better. It’s very bizarre and very frustrating. But it’s also kind of awesome. “Struggling” with English is super cool because it means the language part of my brain put aside a piece for a different language. I can promise you all that that new part of my brain is about 1/100th the size of my English part, but it’s still so cool that that can even happen in as little as five months. I mean, how cool is it that there’s a part of my brain always working in Spanish? Even right now, my mind knows I’m typing English, but I can feel it in my fingers that they want to add an accent mark somewhere. So bacán [cool]. There yah go, fingers. So here’s to not being able to speak either language as well as I’d like to—a defeat that is welcomed with open brazos—I mean arms. I have two days left in a city I’ve spent 149 days in, and I’m not sure either number has hit me yet. Seven days into my trip to Valparaíso, Chile, I was on day seven of crying myself to sleep, calling my dad begging to come home early, and googling 100 different ways to cope with homesickness. Even 40 days into studying abroad, I was on day forty of crying myself to sleep and begging my dad to come home as my search history filled itself with even more blogs. My parents told me if I still hated it at the end of two months that would be sufficient enough to make an educated decision on whether or not to come back to the states 100 days early. Here I am with only two days left and a search history that consists of more than obscure blog posts. I’m grateful I didn’t decide to go home early, but I also wouldn’t belittle those feelings I had for almost two months. I’ve met at least 1 million new friends, give or take, and have traveled to some of the most beautiful sites in the entire world. I’ve learned recipes of food I would have never thought of trying (cauliflower), found myself screaming at the TV screen during soccer games which I would’ve fallen asleep to before, and learned a language I was stagnant with for years. I had some of the most rewarding and challenging moments of my life in a country I was dying to get out of. I was miserable those first two months, but I think most of that contributed to the fact that I had only ever heard how amazing studying abroad was and never about how hard it would actually be. The words of Chris Martin, “No one ever said it would be this hard,” would run through my head at all moments of the day those first two months and even many days after those first two months. Of course I missed my family and friends, but I also missed being able to have a conversation with an adult—a conversation I could actually participate in and be sure I understood every word being said. I missed being able to walk down the streets without someone looking at me being able to tell I wasn’t from here. I missed going to restaurants, ordering something, then having the waiter switch languages because they could tell I just didn’t know their language. “Podemos hablar en español.” [We can speak in Spanish.] “No! It okay. I study English in school. I want practice.” I missed my Midwestern culture, my beautiful city, and walking into a restaurant and knowing what the old couple at the table next to me was saying. People always said, “Get ready for the culture shock!” but never really explained what that meant. However, I’m not sure anyone ever could. Even now I’m having a hard time expressing what I missed and how miserable I felt just because I’m not sure what it was exactly that was missing. I had a family, friends, Netflix, and food, so like…what else even is there? Yet there was still something missing that’s just impossible to explain. Being in a different country for 151 days, well 149 days with two more to go, has taught me it’s okay to be different from everyone else. It’s okay to be ready to go home, it’s okay to have cried 40 days in a row, it’s okay to not be the happiest you’ve ever been every single day of your life, and it’s okay to eat cauliflower and actually love it. If the day ever comes where I have any sort of pull in any number of people’s lives, I’m going to make it a rule that they must study abroad. Without going abroad, I don’t think I could ever be the person I’ve always wanted to be. To be that person I still have to learn how to not start crying at the thought of doing my taxes alone, but I definitely have grown twice as much in these five months than I have my entire life. I care about things like politics and world matters now, and I’ve become very good at asking people to re-explain themselves in words I might be able to understand. Look out United States. Not only will I be tanner and have an easier time pronouncing definitivamente [definitely], but I’ll care a bit more about things other than Justin Bieber and the White Sox’s latest pitching trade. American cuisine, American citizens, American media, American this and American that. I’ve discovered my least favorite word since arriving to South America four months ago. Almost every day, I have the conversation with someone about why I hate the word “American.” We have Miss America, the American Dream, American hamburgers, and the American family. According to the ever-so-accurate Wikipedia, there are 55 countries in the Americas. If that’s true, then why does “The American Dream” refer to only one country? A lot of people in the US wonder why other countries hate us or at least have this massive stereotype that we’re all self-obsessed. Miss America answers just that. Yes, I’m American, but so is my Chilean family and my Brazilian friends and our Canadian neighbors. “De dónde eres?” [Where are you from?] “Soy de América.” [I’m from America.] Those three words give foreigners a valid reason to think we’re self-obsessed—because we are. Using that word that excludes something around 54 other countries from ever using it the way we do. The number of times I’ve been yelled at when it slips in my Spanish is uncountable. “Extraño comida americana.” [I miss American food.] “Debemos tener un carrete americano!” [We should have an American party!] Wrong, wrong, wrong, wrong. What I miss is food from the United States, or what I want to have is a US party. But it doesn’t really work that easy. Just in that phrase, “I want to have a US party,” we all cringe because it doesn’t sound quite right. A United Statesian party? A United States of American party? Gross. Doesn’t work. That’s because our word for United Statesian is American. So although I hate myself for using that word to describe things, I have to—in English, that is. In Spanish, they have a word meaning United Statesian—estadounidense. So when I speak Spanish, there’s no excuse to mess up “American food.” However, when I’m speaking English, I have no choice but to use that word. So I guess we have a reasonable excuse why there are things like the American Dream or American hamburgers. However, we don’t have a valid excuse when people ask where we are from. American as an adjective works in English. America as a noun doesn’t. I’ve definitely become extraordinarily aware of that word since arriving here. Whenever I listen to political debates where the politician says, “Americans need to blah blah blah,” I lose a little respect for them. But how can I lose respect for them when that’s just the way we speak English? People from countries outside of the Americas call us Americans because they don’t usually have a personal tie to the Americas. People from the Americas, outside of the US, never refer to us as Americans. In fact, when we refer to ourselves as Americans, you can bet your bottom dollar, or Chilean peso, they’re going to try to leave that conversation with you as soon as they get the chance. When I went to IU my first semester freshman year, I grew this tremendous pride for being from Chicago. It was something I held in high esteem, something I was proud of. Coming to Chile, I don’t have that same pride of coming from the United States. Of course of course of course I feel blessed to live in such a prosperous country and have a wonderful, safe, stable life, but after coming here, I’ve realized those “American” stereotypes can be so real—even in myself. The stereotype that we’re self-obsessed we already decided has some truth just due to our vocabulary. The stereotype that we’re all lazy and obese isn’t that far off since 1 out of 3 of us are considered obese. Of course this percentage doesn’t track our laziness, and a lot of obesity is due to medical conditions, however, the amount of fast food choices we have or the amount of sodas or the amount of chips and candy and crackers and cheese and all of that is directly related to the statistic. 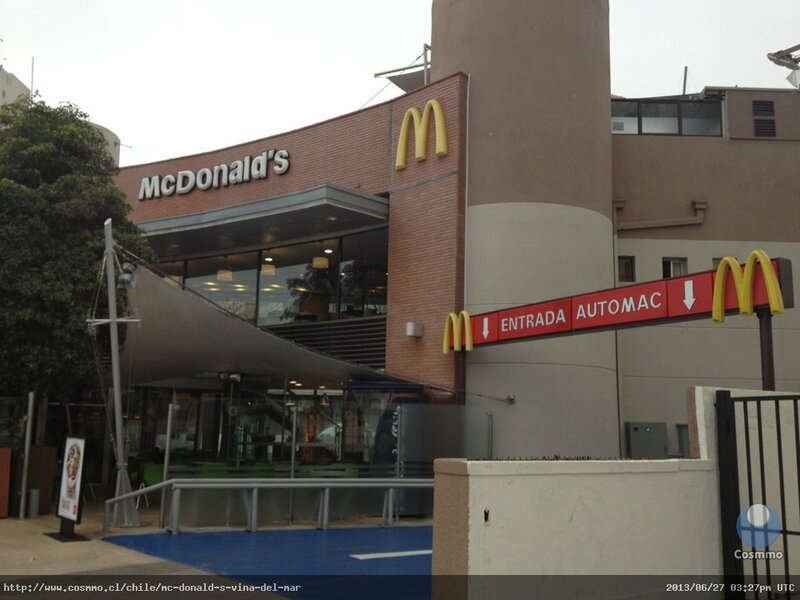 Whenever I walk past this McDonald’s in Viña del Mar, I can always find at least one group of people from the US sitting there. Glancing again at Wikipedia, the list of negative stereotypes perceived by other countries about the United States consists of “materialism, lack of cultural awareness, racism, ‘gun-loving,’ arrogant, etc.” I don’t need to go through every one of these stereotypes and prove the truth that can be found in all of these because I think we can all admit there is at least a sprinkle of reality in every one of these stereotypes. America, the United States, the grand ole US of A is a place I love, a place I call home, and a place I am excited to return to. But I think if I hadn’t left, I would have never realized all the things we can do and should do to change our ways. We have so much to learn from other countries, and if our generation is going to make any sort of a difference in the way things are working right now, studying abroad is an absolute must. To take advantage of this opportunity of affordable travel is one of the greatest opportunities we will ever have in our lifetime, and I truly believe that if we all opened our eyes to other cultures and the views of our own culture from other people, we wouldn’t have someone running for president who fits every single negative stereotype Wikipedia lists. At some point in September, a woman from our program asked if I was going to be at the fútbol [soccer] tournament during some weekend in October. I immediately said “absolutely,” and didn’t realize until I was home the day of 15 hours of fútbol would be on my 21st birthday. Of course I had my hesitations about waking up at 6:45 AM to drive two hours to a professional-sized cancha [field] to play four games of fútbol and return that night around 8 PM. Adding the fact that a huge carrete [party] would be going on when we got home that we’d have to rush to did not add to the excitement of a day many people countdown to in the US. However, this may have been one of my favorite birthdays yet. We arrived to San Felipe, Chile to the house of our coach, Jefe Kelly [Boss Kelly], where her little sister let me hold a baby bunny for half an hour as they surprised me by singing happy birthday with a giant piece of cake. A giant piece of cake while holding a bunny. It was a dream. After arriving at the cancha (that was straight out a movie situated between hills and the Andes mountains next to a herd of cows), we played an exhausting game of fútbol, took a ridiculous amount of pictures, and walked to an asado [barbeque] that was being set up for us. Being surprised with another huge cake and getting my face shoved in it as thirty of my newest Chilean friends sang Feliz Cumpleaños [Happy Birthday], was one of the coolest things of my life. As soon as we arrived back to our home, it was a race against the clock to shower, get ready, and walk over to celebrate three birthdays: mine on that day, my friend’s host sister’s the next day, and my friend’s two days later. With my tomato sun-burnt face, we arrived to hugs and kisses from every one of our friends and about 100 new ones I had never met, but who were just as kind as the friends I had known for months. Feliz cumple, Marie! Que linda! [Happy birthday, Marie! How cute!] was what I heard for the first thirty minutes of the party as everyone gave me two hugs and kissed my cheek at least four times. When the clock struck twelve and my birthday ended as Fiorella’s started, and the third cake of the day was brought out. One might imagine a cake to celebrate three birthday’s might be rather large. This cake was so large that I thought Taylor’s host mom was going to fall over from holding it. Marvelous. We sang once in Spanish, once in English, and then more friends showed up maybe five minutes later. So we did it again. One more blowing out of the candles and two more songs. Although I didn’t get the typical “first legal drink” pic, or people buying your drinks at the bars, I got three cakes, four Feliz Cumpleaños songs, two Happy Birthday songs, countless hugs and even more kisses, and I got to spend my birthday with people I didn’t know and people I did. Since I chose to go abroad in the fall, I’ve been nervous about spending my birthday here because I knew I wouldn’t have any of my family to see or any of my life-long friends to dance with. But instead, I got to make probably 1,000 new friends who were all genuinely thrilled it was my birthday. I love them, and I’m coming back every year to get sun-poisoning from 15 hours of fútbol and three cakes in a day. Explaining what it’s like to live with a host family is extraordinarily hard. It’s almost as hard to explain as it is to live. Imagine living on your own for two years without ever having to tell anyone what you’re doing, where you’re going, and when you’re coming home. To go from two years of being completely independent back to answering those questions is extremely difficult. It’s like when you go home for summer break back to a house with rules and expectations except this is five months adding the element of different cultural expectations and a different language. Living with a host family isn’t so much about answering the questions of who you’re going with and where you’re going and when you’re getting home, but by habit, you say those things anyway. That sentence is on my top three most frequently used sentences. After sí [yes] and ¿qué significa esta? [what does that mean?]. Almost always the response includes a smile with a thumbs up followed by a serious face drop to ten cuidado Meri [be careful, Marie]. Once in a while though, the response is something along the lines of, “Do you leave so often because you hate my cooking! ?” And when that happens, it’s like a slap in the face reminder that I live with a family again. The fact that you have to tell people you’re leaving isn’t the hard part. The hard part is finding out what your host family holds high. For example, it took me 70 days of living in this house to realize that my host family really cares about the family eating together whenever at all possible. It also took me 70 days to realize that spending the entire day in your room except for times when you’re eating dinner is okay, and they don’t do it because they hate you. Obviously, I’m not speaking for all Chilean families when I say this, but of all the houses (6) I’ve seen since being here, there is no living room like we have in the US. There’s no place where you watch the latest episode of Parks and Rec together while eating pizza or drinking chocolate milk. Instead, the gathering place is the bed of the parents where they catch up on their latest soap operas or watch the breaking news about another earthquake strike. Some nights, dinner, which consists of bread and tea, is spent in the bed as well. The idea of family bonding is extremely different here than in the US, and that’s what has been so challenging about moving in with a new family. In my house, family bonding is even more different from some of my friend’s houses. I live with a host mom, dad, and sister—all of whom are much older. Living with a set of grandparents has its pros and cons. Not going on adventures and only leaving the house together when we have a meeting to go to are absolutely on the con list. However, pros include things like grandkids running through the house and the understanding that comes with having raised four children. I still get asked questions about where I am going, but it’s more for them to know where I am in case an 8.4 earthquake strikes. They’ve grasped the idea that I’m a 21-year-old who will be going out and living life outside of the house. They also understand that after a game of fútbol [soccer], I might not have the biggest desires to sit at the dinner table and eat with everyone. Sometimes a tray filled with food, a bed, and Netflix is all you need at the end of the day. So, yes, living with a host family is really hard and isn’t always butterflies and rainbows. However, since moving in 87 days ago, I’ve learned over 100 new vocab words (especially food), tried 100 new kinds of food, and made little 7-year-old friends—all of things I would never had experienced if I chose a program that doesn’t require host families. Don’t get me wrong, those programs have their pros too, and I probably would have adjusted a little faster to a live in a dorm that I’ve lived before. Although, living in a dorm would have meant I would have never found my Chilean friends, I would have never tried cooked cabbage with hotdogs and potatoes, and I would have never had a host mom to hug me when a lady stole my smart phone on the bus. Even though it took 70 days of this 151 day journey, I am very lucky to live in a house with home cooked meals and pieces of cake next to my bed when I get home after a day of class. As I was trying to figure out what a good opening sentence to this blog would be, my mirror shook and the chandelier above my bed swayed for at least the 50th time after an 8.3 earthquake hit the country of Chile. It was a few minutes before 8 PM when I was sitting in my room watching a video of how men’s swimsuit fashion has changed in the past 100 years when I felt my bed swing back and forth. As my host family and I all stayed in our rooms as we waited for the typical 20 second tremor to pass, the tremor became a little stronger and the clock seemed to tick a little faster. I texted my dad: “HUGE EARTHQUAKE RIGHT NOW. Longest ever?” It was 7:58 PM. About 30 seconds later my host mom yelled for her daughter and me to get to the living room and remain calm. The ignorant, idiotic smile that was usually on my face during tremors was wiped clean as I walked 20 feet to the living room to see my host parents taking down all of the lamps from the tables. As soon as that was done, we stood in the middle of the room holding each other, riding out the tremor that turned into a full earthquake. Lamps that still sit on the couches for the 6.4 and up aftershocks still occurring. “Tranquilla, tranquilla, tranquilla,” she repeated over and over again as if to calm herself down instead of me. After 60 seconds, I looked up from staring at my host mom’s terrified face to see the paintings on the wall pound back and forth against the wall. Slam, slam, slam. My host mom grabbed my hand harder as the four of us tried to keep our bodies and minds steady in our swinging building. Ninety seconds had passed as I texted my dad for the second time. “It’s still happening. We’re all in the same room.” 8:00 PM. Two full minutes went by as we all walked into the parents’ room to watch the news as the earthquake still shook the house. The TV said an 8.3 earthquake had struck a town 4 hours north of us. Almost three minutes went by as the earth came to a slow stop. We looked at each other and sighed a communal relief. “Ay! Que fuerte, no?” [How strong, no?] we said to each other as we walked back to our rooms. Knives that still hold our cabinets closed for the 6.4 and up aftershocks still occurring. 8:01 PM Texted my dad again letting him know it was over and all was okay. I spoke too soon because as soon as I entered the doorway of my bedroom, my host sister’s phone was buzzing and setting off a sound I had never heard, but from that point forward, that sound would be forever engrained in my brain. Seconds before we left the house, I sent that last text to my dad. “Tsunami warning. Evacuating house. Talk soon.” 8:03 PM. As we got outside, the streets were bursting with people. Families were running hand in hand, dads were carrying babies thrown in blankets, and we were briskly walking to the nearest hill as my 70 year-old host parents struggled to keep up behind us. We finally made it to the closest hill after enduring another slightly smaller earthquake with thousands of our neighbors. Three hours passed as my sister’s phone still buzzed with evacuation warnings when we decided it had been long enough. Every newcomer that passed our refugee said there had been no signs of tsunami waves in our town. We marched home in streets that would have been unrecognizable if I didn’t know where I was. They were black and empty—the opposite of three hours previous that had frantic, honking cars and hundreds of families rustling through. I, and most gringos (foreigners), are on our fourth week of classes. Ask my Chilean friends how many weeks of classes they’ve had so far, and they’ll let you know they’re starting a week from now—five weeks after we’ve started. Why you may ask? Thanks for asking; it leads me right to my thesis. Chileans strike, strike, strike due to poor conditions many of them are forced to work under. Just in the four weeks I’ve been here, there have been three. Although it’s first semester for us Northern Hemisphere kids, it’s second semester for the Chileans right now because June-August is their winter. (Aka 50 degrees most days—beach weather for those of us who live in the Midwest.) So first semester, January-June, there was a paro at the University. This paro lasted 57 days until July 27th, the beginning of second semester, everyone decided they wanted to come back to school. Okay. Okay. It’s not that easy. They didn’t paro because they just didn’t want to go to school. Some say the paro was because university is too expensive and others say the teachers weren’t making enough money and others say it’s because the teachers aren’t good enough to teach. It really just depends on who you ask. When I asked my host mom, she said it was because the professors aren’t qualified. When I asked friends attending La Catolica (short name for the university), some said the teachers initiated the strike while one said it was because school is too expensive. According to the very reliable resources of Wikipedia and frustrated Chileans who don’t love Argentinians, many universities in Latin America—especially in Argentina—have options to attend public universities where tuition is free. So if I had to choose a reason why I thought La Catolica and other universities go on strike, I would assume it is because of the cost to attend school. Although it’s a fraction of what we have to pay in the US, it’s a lot compared to what local workers are paid. Workers’ wages here are shockingly low. Not only does that affect families whose children are going to school, but it affects businesses’ hours of operation. That’s right folks. We’re headed into paro dos. Anyways, the office where we have to get these IDs is obviously government-run, and from what I’ve gathered in class and at the dinner table, government workers are not paid very well. Minimum wage here is 225,000 Chilean Pesos which roughly translates to 320 US Dollars a month. People working on minimum wage, which is a large percentage of the population (especially immigrants), are making $320 a month. Translating that to trying to send kids to college makes strikes at places like the ID office completely understandable. Even if these folks aren’t on minimum wage, I can imagine they still aren’t making enough to support a family. Because of all of this, the ID office was on strike for a week. This strike was more enjoyable to watch though because there was a human blockade outside of the office for the first day with workers holding signs and chanting songs I couldn’t understand. To the gringos, it isn’t that expensive here to get an empanada or a bus ticket, but if you’re making a fourth of what US minimum wage workers make, it could seem that everything is incredibly expensive. Here we are at our third strike in four weeks; the only mode of transportation decided to go on strike. A day without transportation. All micros (buses) went on strike for the same reasons as the ID office. “Well, Marie, just take the metro!” Great idea, reader! However, the metro has recently been demolished due to the semi-hurricane we had last weekend. The Chilean laid-back mentality was, “Just don’t go to classes tomorrow. It’s not worth it.” Whereas many of us gringos are having panic attacks in our bedrooms the night before trying to figure out how to get to school four and a half miles away. Options were plentiful—use one of the hundreds of stray dogs as a horse or by swim our way to the other side of the port. Spoiler alert: I decided to walk. After nine miles and three hours worth of walking along the beach in “winter” (63 degrees that day) to get to class and back, I arrived home, crashed on my bed, and fell asleep without a second thought. These paros are exceptionally frustrating, but if there weren’t any strikes, would I really be studying in Chile? Regardless of how many paros try to interfere with our studying abroad, how could anyone ever possibly be angry at a city when it looks like this?